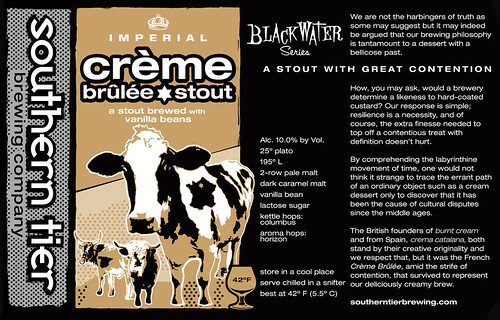 I first heard about Southern Tiers Crème Brûlée Imperial Milk Stout on Twitter, many moons ago. The name alone intrigued me. But then it slipped my mind. Soon it popped up on slashfood and not too long after I tripped on it when trying out a new store. This was basically the ultimate desert beer, this Crème Brûlée Imperial Milk Stout. I drank my Crème Brûlée out of Wychwood Hobgoblin gift set Pint Glass, which is little taller a skinnier than normal pint glasses. The stout was as black as a stout should be, but with VERY little head. The smell that came off the glass was very sweet, almost a little overpowering as is came out the bottle, but the vanilla crème nose was great, addictive almost. I spent a minute just smelling it. 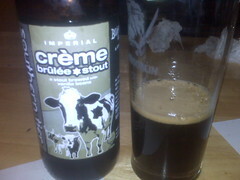 The body of the Crème Brûlée Imperial Milk Stout was full, creamy and thick. It was the sweetest, richest stout I have had to date. It made this beer a grea t fusion of desert and beer. The hops ( kettle hops: Columbus and aroma hops: Horizon) in this stout were overpowered to me. I did not really notice them at all. I thought I felt a really slight bitterness, but it may have been my imagination. I actually love the flavor of this stout, it was shockingly Crème Brûlée, shockingly tastier than I thought it would be. This stout throws balance out the window. It does not need balance. The stout has a super complex flavor profile, especially once you got past the sweetness and let it warm up a little. The alcohol feel, it’s a sneaky one it is. The sweetness of Crème Brûlée Imperial Milk Stout hides the alcohol well. The stout does not have a high drinkability; it’s a novelty. I can not drink this all the time. Once a year, on a special occasion maybe, with a few people present. This is not a beer to drink alone, it’s to be shared with friends! I love the cow on the bottle and the packaging is very cool. 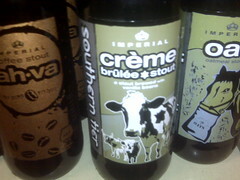 I took a picture of the bottle and posted on twitpic and was questioned why there was a cow on my beer bottle. The label is great, very engaging. The suggested temp on the bottle was very much appreciated. When choosing something to have with this, I went a little insane with the Crème Brûlée Imperial Milk Stout and actually had it with a whoopee pie. If I were ever do drink this again I would have it with REALLY DARK chocolate. Because I could not continuously drink this, I could not really pair this with any comics. In the end, I actually found this beer to be fun. It was a bit extreme, but that’s cool now and then. It’s another great example of the diversity and playfulness of the beer world. I have several other beers I want to try form Southern Tier so stay tuned! Wow, I like the sound of this beer. I don’t think I’ve seen it, but I’ll have to keep an eye out for it. I’ve been trying a lot of Milk Stouts lately, so I’m in the mood for this sort of thing! Nice write up!